The main prize of the Manny Machado deal with the Dodgers last season, the Orioles' top prospect struggled during his first half-season with the organization. 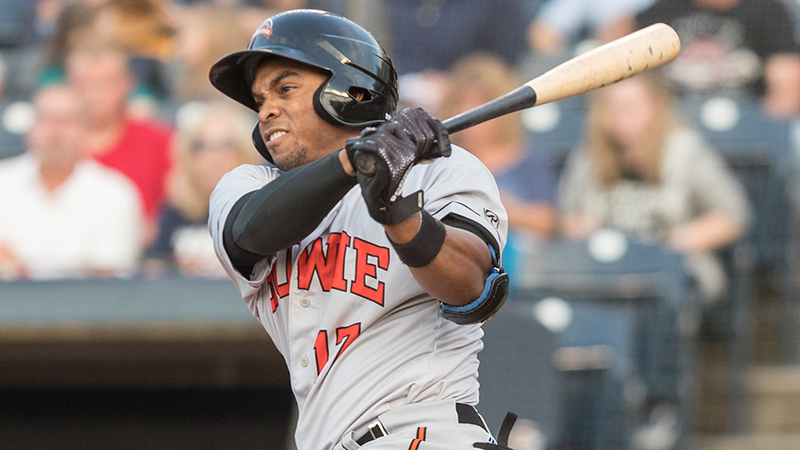 The 22-year-old batted .239 with five homers and 15 RBIs in 38 games with Double-A Bowie after compiling a .314/.428/.477 slash line with Double-A Tulsa over the first half of 2018. That was good enough to earn a selection to the Futures Game. Recently, though, Diaz has done plenty to quell suspicions. The Havana native made the most of his invitation to Spring Training, going 11-for-33 with a homer, seven RBIs and a .839 OPS. While Diaz clearly can hit, he's also an exceptional fielder, possessing 55-grade arm and field tools. MLB.com's No. 64 overall prospect also can play all three outfield positions, although right field may suit him best. "I think it's just his tools and projection," Orioles director of Minor League operations Kent Qualls said when asked what makes Diaz special. "He's a plus-runner, he's got plus-power, he's got an excellent arm. He's an excellent hitter at a young age." Heading into 2019, it's likely the 6-foot-1 prospect will start the year with Bowie or Triple-A Norfolk. But Diaz could be on his way to the Major Leagues sooner rather than later, especially with Baltimore having limited outfield depth during the rebuild. "You never know," Qualls said. "He's been a quick mover to this point in his career. He definitely needs a little more seasoning in the Minors, but he's a good enough player that he could potentially make an impact this year." Speaking of outfield prospects who can have an impact in 2019, Hays is another prime candidate to spend considerably time at Camden Yards this season. The O's fourth-ranked prospect debut with Baltimore in 2017 and batted .217 (13-for-60) with a homer in 20 games. Last season with the Baysox, the 23-year-old didn't rake at the level he did at Jacksonville State, which prompted the O's to select him in the third round of the 2016 Draft. Hays batted .242 with a .703 OPS and 12 homers in 66 games (he had a nine-game rehab assignment with Class A Short Season Aberdeen). An injured ankle, which he had surgically repaired during the offseason, caused him to miss a significant amount of time last year. But he's been healthy at Spring Training and has been a revelation during Grapefruit League play, putting together a performance that has made him a strong candidate for the Opening Day roster. "He obviously worked really hard this winter and went through the rehab process to get himself to a place he was health-wise about two years ago," Qualls said. Despite batting .351/.385/.892 with five jacks and 13 RBIs this spring, Baltimore optioned Hays to Norfolk on Sunday. With the Orioles likely to eventually require outfield help, Hays -- with big league experience -- should get the call. As the 22nd overall pick in the 2013 Draft, Harvey made the Orioles look like they struck gold based on his initial performance in the Minors. A strong first half in 2014 with Class A Delmarva landed him in the Futures Game at the age of 19. Fast forward five years and Harvey has endured five stints on the Injured List, including an elbow strain that caused him to miss the end of 2014 and all of 2015. Tommy John surgery followed in 2016, before the 6-foot-3 prospect made his way back to the mound for eight starts across three levels in 2017. Along the way, Harvey has tumbled from the Orioles' No. 1 prospect to No. 12. In nine starts (32 1/3 innings) with Bowie last season, the North Carolina native went 1-2 with a 5.57 ERA and 30 strikeouts. His last start came on June 1 -- Harvey landed on the IL after suffering a shoulder injury while dodging a foul ball into the Baysox dugout, then felt elbow discomfort in August in the middle of his rehab. "He's completely healthy. He had a normal offseason -- another guy that worked hard," Qualls said. "I know he made a real positive impression on the Major League coaching staff who were all seeing him for the first time. He needs to put in the work and build up his pitch count and keep working on his stuff." The right-hander still possesses a 60-grade fastball and curveball. But the challenge of taking the mound every five days has put Harvey in this category. "He still has the same ability and the same projection as he's had all along," Qualls said. "He's ready to go." At 24, there's no better time for the right-hander to produce a healthy season. While one former first-rounder is at the crossroads, the journey is just beginning for Rodriguez, whom the Orioles selected with the 11th overall pick in last year's Draft. The right-hander bypassed a commitment to Texas A&M and signed with the O's for $4.3 million after going 14-1 with a 0.38 ERA and 178 strikeouts Central Heights High School in Texas. The 6-foot-5 hurler enjoyed instant success in the Rookie-level Gulf Coast League, making six straight scoreless starts to begin his career. He ultimately finished with a 1.40 ERA and 20 strikeouts over 20 1/3 innings in nine games, including eight starts. Baltimore was careful with the 19-year-old, considering he already had a senior season under his belt. It will be interesting to see how long a leash they give Rodriguez heading into his first full Minor League campaign. "We're always careful with all of our pitchers. Certainly, we'll be careful with him as well," Qualls said. "He's competing for a full-season spot. Very mature, very bright, pretty advanced for a high school Draft pick. He has a very projectable frame and pitch types." Qualls credited Rodriguez's prep training that left him with a 95-mph four-seamer, a curveball, slider and changeup. A high school pitcher with a four-pitch repertoire is rare, and one who knows how to use it is even rarer. "We're thrilled to have him here and he's making great progress," Qualls said. Hall, who checks in at 14th on the Orioles' prospect rankings, was the organization's second-round selection in 2017. He played in only two games that year but showed last season with Aberdeen why he belong in this category in 2019. Over 222 at-bats in 62 games with the IronBirds, Hall posted a .293/.368/.374 slash line with one homer and 24 RBIs and reeled off a 19-game hitting streak. The 19-year-old used his 60-grade speed to steal 22 bags in 27 tries. He isn't projected to hit for much power, but he brings athleticism to the field with his range and strong arm. Hall might be a while away from reaching the Majors, but his development is something to watch, particularly if he can build off a successful 2018 campaign that resulted in MiLB.com Organizational All-Star honors. Chances are he begins the year with Delmarva, Qualls said. "He really had a very productive season in Aberdeen as a 19-year-old; that's a real young age for New York-Penn League," he added. "Great range, above-average runner. He finished up really strong. It's going to be fun to watch him in a full-season league this year." More to keep an eye on: A robust trio of lefties -- DL Hall, a former first-round pick and MLB.com's 90th overall prospect, Keegan Akin and Zac Lowther -- are all coming off solid seasons. Hall posted a 2.10 ERA with Delmarva, Akin won 14 games and fanned 142 batters over 137 2/3 innings, winning Eastern League Pitcher of the Year honors, while Lowther led the system with 151 punchouts. Akin is closest to the Majors, with the other two right behind. ... Right-hander Dean Kremer and infielder Rylan Bannon were the other pieces in the Machado deal and their progress will be monitored to determine how well the Orioles fared in the swap. ... Richie Martin is an intriguing case. Although he batted .300 with eight homers for Double-A Midland last season, the A's chose not to protect him in the Rule 5 Draft, enabling Baltimore to scoop him up. He's a candidate to win the Major League shortstop job out of camp.